I had such big plans for today...until the wind picked up and threatened me with clouds and rain. It was sunny at 6:15AM when I got out of bed, and still sunny at 7:15 when my daughter got on the bus. What happened to my sunshine? As they say, "Welcome to Alberta!" I am hoping it blows over. I know I should check the weather report, but then I'll just be disappointed if this is supposed to carry on throughout the day. We had our April showers (and snow) - bring on the flowers! Yesterday I rearranged my solar lights and moved a few things around the yard. I was sad last night, because I noticed my wind chime solar light (not to mention a few others) wasn't working. I have a few extra batteries, I just hope they will fit in the lights I need them to. The extra batteries were the result of the dog thinking the lights were his personal playthings. I realize he must have been bored but couldn't he chase the squirrel or something, instead of destroying my lights? I will venture out and see what I can do in the yard in a little while; raking will not be on my list though. There is much to do before I can even think about planting anything. Although, I do have one garden bed ready - perhaps my multiplier onions can go in today. As I was cleaning on of the garden beds, I noticed my Bleeding Heart may have winter killed this year. I am hoping I am wrong, but when I pulled on the dry stems the roots seemed mushy. Looks like the local greenhouse will be selling me another Bleeding Heart this year (or maybe two). The Bleeding heart is one of my favorite flowers; this one would have been huge this year, as it is year three or four since it was planted. I guess I will have to wait until it warms up a little more to know for sure. 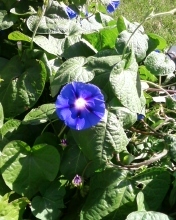 Another of my favorite flowers is the Morning Glory. I had a garden bed full of them last year, and they were huge. The funny thing was I planted peas in that bed, not flowers. I have no idea how they got there, but was pleasantly surprised. I didn't have a trellis so they grew out instead of up, but were beautiful just the same. I took a picture of one (see below), which is the Heavenly Blue variety. I had planted some in a planter, but the volunteer ones did much better. My daughter bought me a planter for my birthday/Mother's Day last year, and I had put some Morning Glories, Nasturtiums and a Citronella plant in it. I had envisioned the trellis covered with flowers and the base overflowing with greenery; it was not to be so. I'm not quite sure why, but I do have my hunches. It is a very nice planter (pictured below) and a good size, but I do believe the wood stain has a lot to do with the quality of growth. I'm guessing perhaps it leached into the soil, or maybe the planter just got too hot? This year I will be adding soil that retains moisture better, so hopefully that helps the plants grow. The question is, where do I put it this year and what do I plant in it? (Okay, so that's two questions.) It does have one disadvantage, and that is being a bit top heavy. When the wind blew it would fall over, which perhaps didn't help the plants grow either. I am contemplating placing a few rocks (a quick walk out to the field and I should have more than enough) inside to give it a little extra weight in the bottom. Have a great day, and please join my Facebook Group, Gardening - Inside & Out! I would love to see pictures of your garden and hear about your experiences.